Kayakers take a rest along the Abel Tasman National Park beach front in the South Island of New Zealand. Sea kayaking is a popular tourist activity that offers spectacular views of the gorgeous coastal scenery of the park. Two kayakers prepare to embark on one of the most popular ways to enjoy coastal sight-seeing in New Zealand as they ready their kayak on the beach at Arch Point, located in Abel Tasman National Park at the north end of the South Island of New Zealand. Even from the beach front, the view of the spectacular coastal scenery is stunning. Golden beach sands contrast with the vibrant blue-green sea and the deep green forestry on the hillside cliffs. Once seated in the cockpit of the kayak, paddling the Golden Bay waterway off Arch Point at Abel Tasman National Park, kayakers are treated to an even more glorious view of New Zealand's natural beauty and scenic diversity. 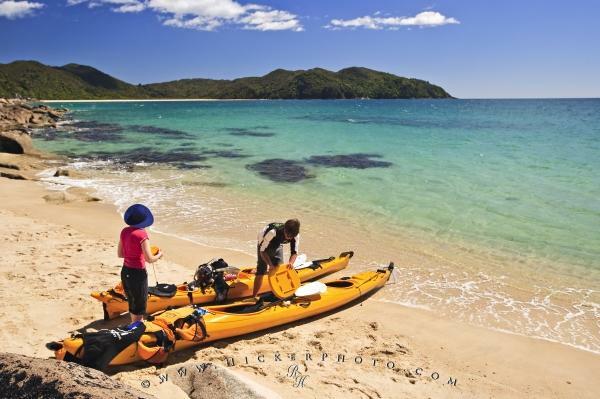 Photo of people on a kayaking tour to see the coastal scenery of Abel Tasman National Park, South Island, New Zealand. ... Local professional tour companies offer a wide variety of experiences to delight tourists of all levels including beginners. Guided tour packages range from one day excursions up to five day adventures into more remote areas around the park. Twilight tours feature a different experience under the stars. Regardless of the length of a kayaking adventure, kayakers will see a diverse amount of New Zealand's protected natural beauty including golden beaches, naturally formed granite arches, lush foliage, tranquil lagoons and remarkable reefs. Most tours also build in time for beach exploration, sun bathing, swimming and snorkeling. Abel Tasman National Park, founded in 1942, is located between Golden Bay and Tasman Bay on the north end of South Island in the Tasman District of New Zealand. The nearest large town to the park is Moteuka, 20 km south. The smallest of all New Zealand's national parks, covering 225.3 square km, it was named after Abel Tasman who in 1642 was the first European explorer to visit New Zealand. I photographed this photo with the digital SLR camera model Canon EOS-1Ds Mark II, aperture of f/5.6, exposure time of 1/200 sec. on ISO 100, as always I used a original Canon Lens, the focus lenght for this picture was 29mm.